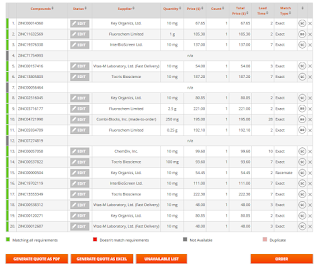 Have you ever had to purchase a set of compounds, so you search one by one, pondering which supplier to choose for each compound to minimize shipping charges, all while thinking: Why can't I simply upload the whole list and let the computer calculate the best way to order this set of compounds? Now you can use MolPort List Search tool to convert your compound list to a quote customized to your criteria. Of course, you can finish the order online, too. 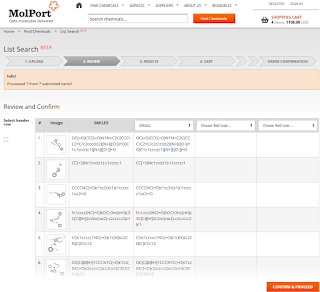 Even though you can send your compound list to MolPort customer support and get a quote in that same business day, there are still advantages to doing it yourself. 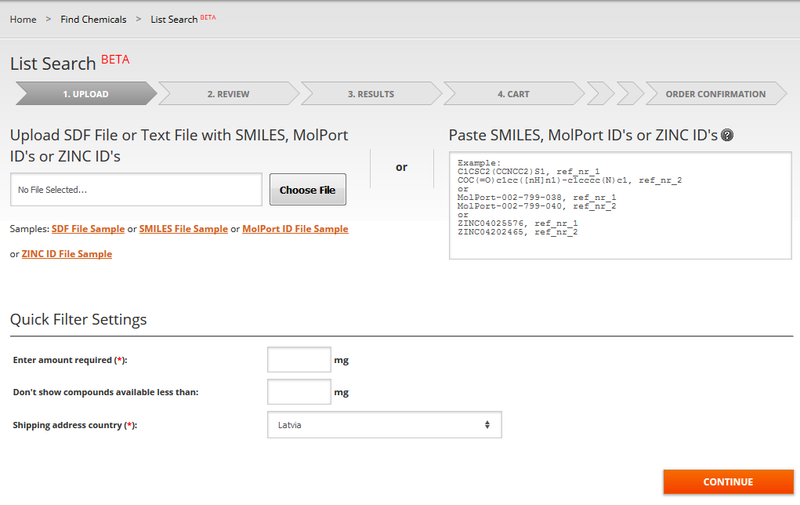 With List Search you can convert your SDF file, SMILES or MolPort ID list to a shopping wish list in just a few steps. You can customize your shopping list quickly and with little effort: change supplier ranking algorithms, set maximum lead time or price cap, and adjust desired quantity. This is all performed on the current vendor data. It is useful to customize your list if you are not yet absolutely sure which compounds to purchase, or when you need to see the complete offer to understand which changes to make next, and you need it done instantly. Start by uploading your compound list. 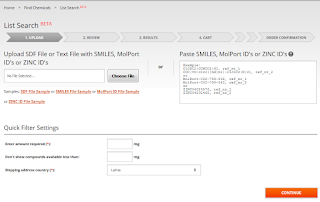 Use this simple form to copy/paste the list from Excel or another program, or upload an SDF file. In the next window you will be asked to confirm if the engine read your data correctly. Adjust if necessary, and press the Confirm and Process button. The compound list will be processed, matching the entries with commercially available compounds. Then, for each entry you’ll see the available quantity, supplier reliability, lead time and price. All factors available to MolPort will be considered to prepare an optimized shopping list. 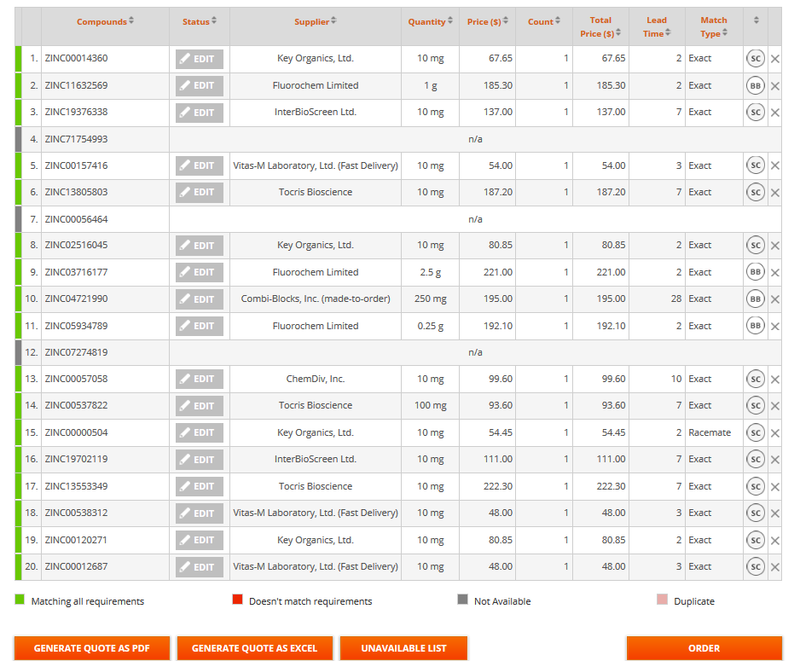 Our algorithms take into account shipping charges as well. Sometimes it is cheaper and smarter to buy a more expensive compound (by comparison) in order to keep the number of shipments to a minimum. You can adjust this shopping list according to your preferences. Most of the time you can go from the compound list to the final shopping list in about one minute. When you have the shopping list finalized, you can either generate a quote for your purchasing department or place an order online and pay with a credit card. Question? Ask them on our Forum. Ready to get started? Visit our site.